I used the dashed circles from CSS's Shapes: Circles set and the the butterflies from Modern Basics. I added a sentiment from Communique Sentiments. To top it off, I added a few little black pearls. Hope you had a great weekend! I can't believe school is about to start here. We are on the count down. Sad and happy all at the same time! :) Thanks for coming by! Have a great day! Stopping in tonight with the winners from the Shaped Up Blog hop and the winner of the Design Principles class with Britta Swiderski! SO cute! I love that sweet little banner with the baker's twine! Sounds really wonderful - I could sure use it. Congrats to all the winners! Please send me your address and I can get your prizes out to you! Susie please send me your email address and I can pass that on to Britta! Thank's to everyone who left comments! Have a great day! Time for more purging of the ole craft room! Everything comes from a smoke free home. These stamps have all been used unless indicated brand new. Some sets do have stained stamps. They are all in CD cases and labeled except for a couple of the Think Bigs. If you contact me today, I will get them in the mail to you tomorrow! If you have questions, just let me know. Shipping is $2 in the US. If you are looking for something in particular, just let me know and I can see if I have it! I can also get quotes on international shipping! Email me with any questions at ll_willison@yahoo.com. Thanks! And I will be adding more soon! 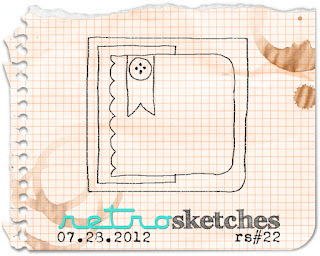 Stopping in this morning with a short post for Retro Sketches. 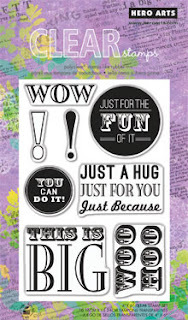 This week we have a sponsor, Alley Way stamps! I have the most adorable set to work with...Sea Mates. Sadly, we are saying goodbye to Jackie this week! I have enjoyed the short time we've had to hang out and I'm going to miss her! Jackie is starting up her own challenge blog so you'll have to stop over there and she what she has going on! Good luck Jackie! Hugs to you! Thanks for stopping in! Have a great day! Scroll down to see about a chance to win a seat in Britta's design principles class. Keep scrolling for this week's CAS-ual Fridays post. And scroll a little more for the Shaped Up Blog Hop..with a chance to win! Does this mean I have too many posts? Just lots of fun stuff going on right? First off, I had several emails and comments about the die used on THIS card. It is from PTI and you can find it HERE. Please forgive me for not getting back to you sooner. I received the sweetest email from Lola and it reminded me that I needed to post the link. Thanks Lola! Some more on Clear and Simple....I love getting your emails with questions on my favorite things! I think the most asked questions, are about the dies. It would be SO hard to pick just one thing. SO, I would say that any of the Shapes would be a good addition to your crafting stash. 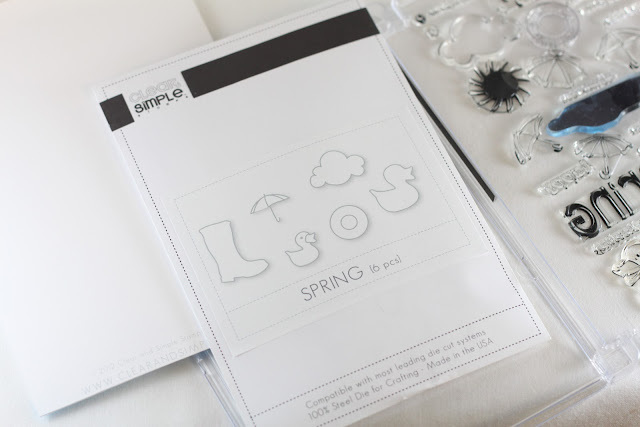 They include matching frame stamps which come in so handy! I also love their party favor boxes. They are really fun to work with. 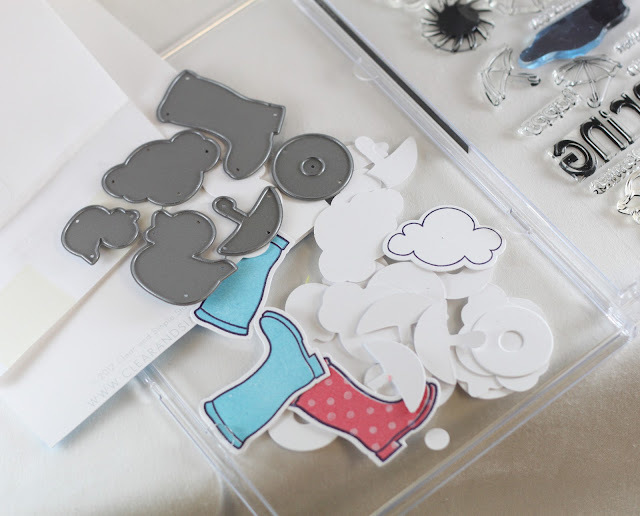 I am also a fan of the new topper dies...they work for more than just bag toppers for sure! Go check out their latest release. You can see all of Collection 4 HERE. And lastly, I've had several questions about my inks. I use all kinds. I have lots of the new PTI ink but I mainly use Amuse. They give such a great, solid image and they have so many fun colors. 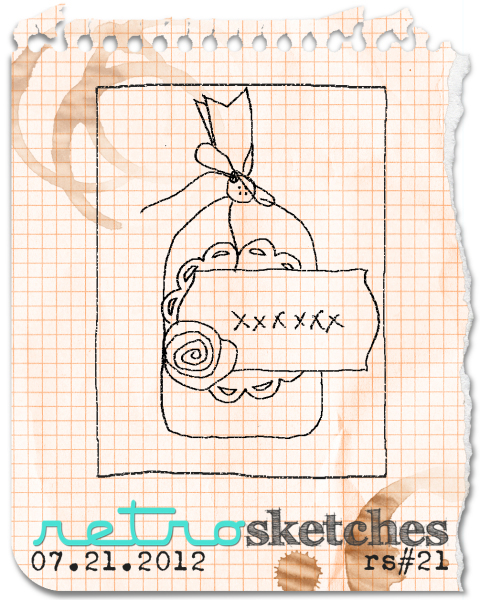 I have had lots of luck using CSS Anonymous Source...which I have raved about before and then inking up with a color. I mainly do this for the larger solid images and it really helps out. You can see more about that HERE. ETA: Regarding Kathy's comment....if you are looking for an alternative to the Amuse inks, you can go HERE to see the Fresh Inks from Impress. HERE is a color chart pdf they have so you can see what they have available. I have several of these in my card but have not used them myself. I hear nothing but good things though. So when I do get them, I will let you know! 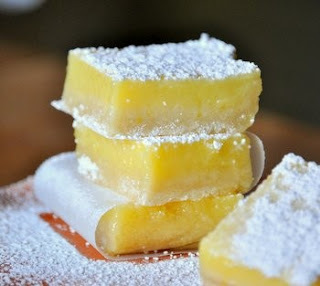 Now here are a few of my favorite recipes that I have tried recently...and I am linking to the pins I have on Pinterest so you can pin too, if you'd like! You know how you see amazing pins all the time but never really know for sure if the recipes are good? Well here are a few...personally tested and loved! And I had to add in one more dessert here. These things? 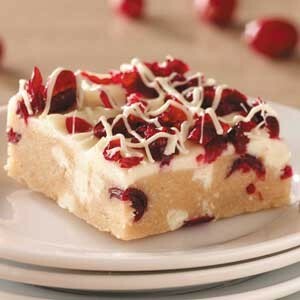 Well....if you think you might eat more than you should...don't make these. Seriously...just keep right on scrolling. There really are no words about how much I love these things. WOWZA! Disclaimer: These pictures are not mine. During the baking process, I was too excited for the end result to even think about taking pictures. 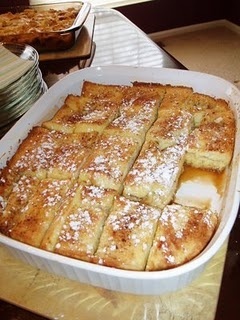 I borrowed the pics from Pinterest, and each pin that I have linked here, links back to the recipes and sites, of which, someone else originally pinned and then I repinned! :) So go pin them too! :) I'd like to thank the owners of these four recipes, for making my kitchen and my kids so happy! Ok and me too! So that is it for my first installment of Pinterest Favorites. As I bake more, I may share more! If you have a favorite pin, please link up in the comments! I'd love to see them! Thanks for coming by today! Don't forget to sign up to win a spot in Britta's class. You can read about it HERE! 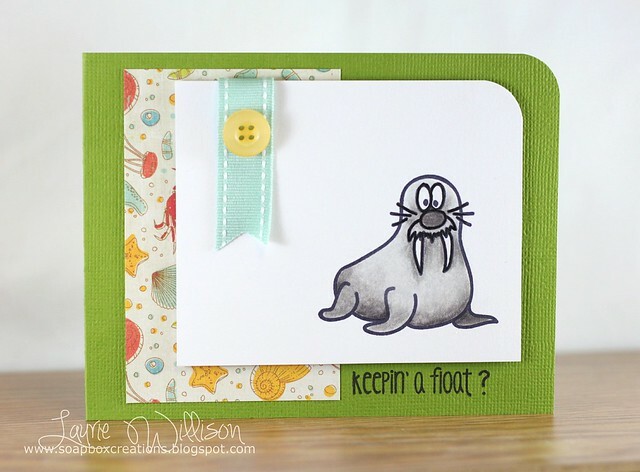 And time is running out too, on the Shaped Up Blog hop. Click HERE to comment for a chance to win! Scroll down for this week's CAS-ual Fridays Challenge! 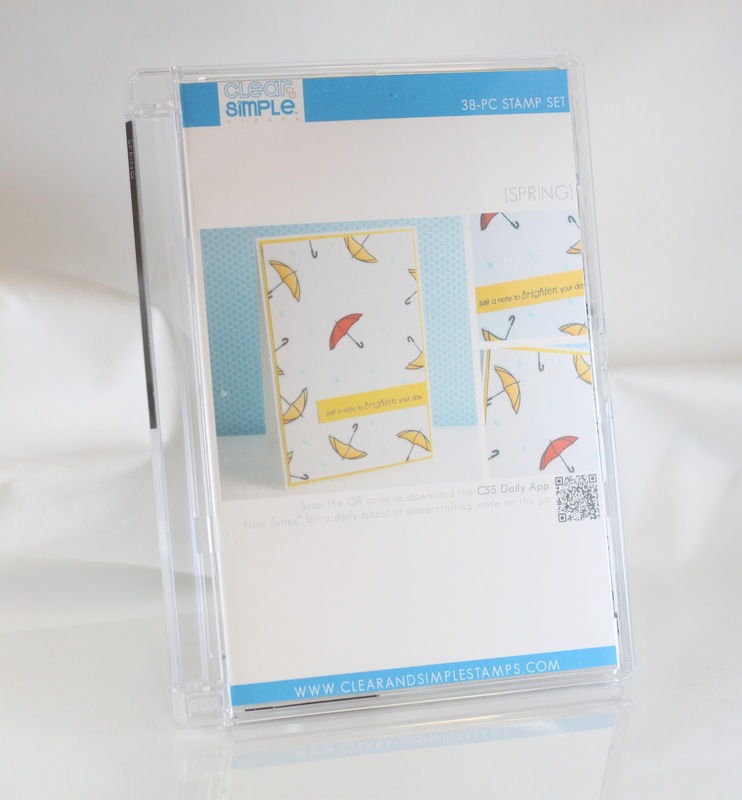 Design Principles is a class taught by Britta Swiderski where she shares the lessons she has learned in her college design classes and brings them to you in a language that we all speak – papercrafting! This class will nourish your understanding of good design and give you the ability to “talk design” when you see a card (or layout or advertisement or painting!) that gets your creativity flowing. This class consists of 5 and a half weeks of classes dedicated to making design part of your everyday life and creativity with more than 40 videos, dozens of card examples and a fun class setting that will inspire you on a daily basis. To enter to win a seat in this class, comment below and I will draw a winner on Sunday evening. I can't wait to see you over at class. It's going to be a really fun time! If you already have a seat in the class, feel free to leave a comment - you can always gift your seat to a deserving friend! 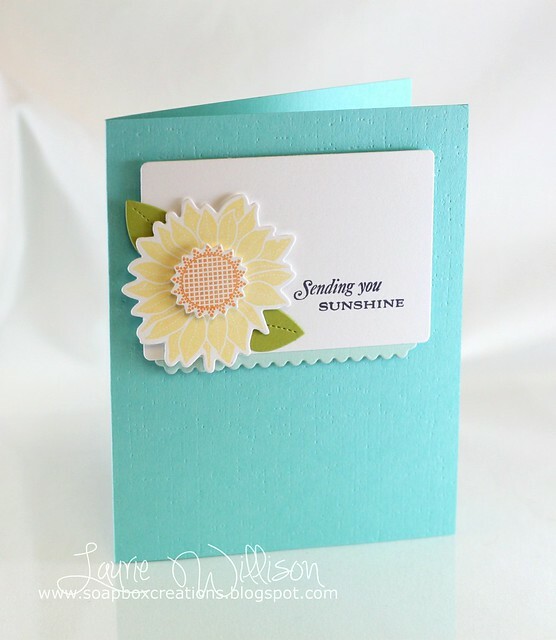 Stop over to the CAS-ual Fridays blog to see more with this color combo creation. You can also see what the prize is for this week's winner! Thanks so much for coming by today! Have a great one! 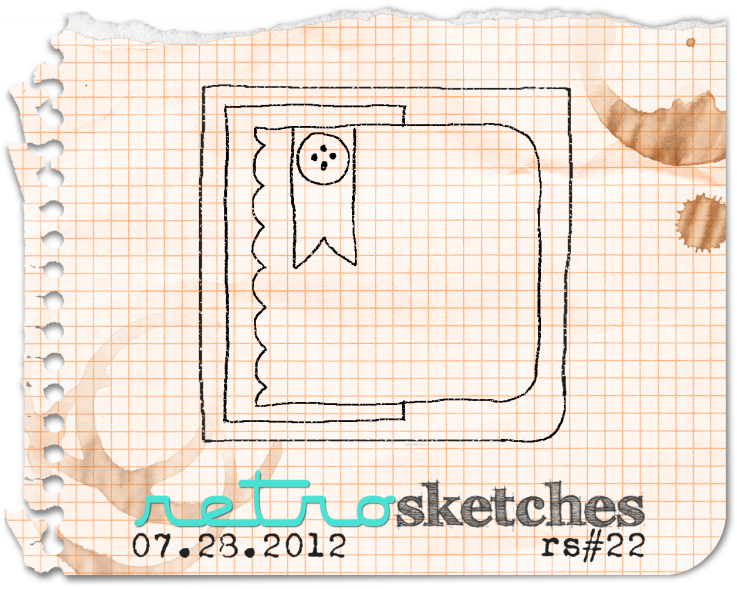 I made this card using Squares Plus, a fun new background this month. The possibilities are endless with this set! I also used the topper dies to make the little side elements. I love it that those dies are so good for so many things! Just wait to see what I have for you starting August 6th...CSS Release in Review! Hope you are all doing well! We are in the middle of Tennis camp this week, swimming lessons and today 104 degree weather. Oy! I was just telling Suzanne tonight I am also working on inventing an air conditioned shirt. lol. Not really but if you have one already, I would like to borrow it! :) haha! Ok off to get the kiddos in the tub! Have a great night! 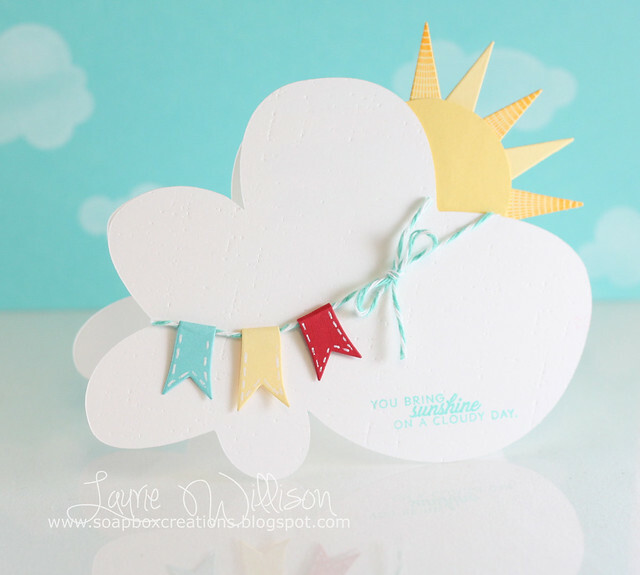 I made this cloud card using my Cricut. I added in a sun and some rays from PTI's Sunshine set along with a little Linen IP in the background. The little banners are from Clear and Simple's Flag Favors Dies. Of course, that gorgeous twine is from the Twinery. I cut the banners in half and then added some white gel pen detail. I wrapped them around the twine and attached them with a glue dot. Easy peasy! All you have to do is leave a comment for a chance at one of these 2 prizes! Commenting ends Sunday July 29th 11:59PM EST and I announce the winners on Monday, July 30th! 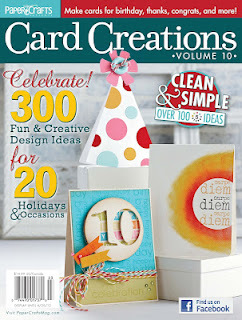 I'd like to give a big shout out to Paper Crafts magazine for all they do and for the fun prizes during Gallery Idol! 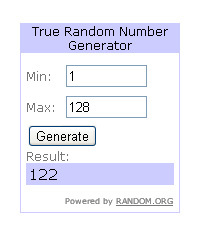 I feel honored that my card was chosen for the Top 20! So your next stop on the hop is Tessa's blog. I can't wait to hop along too, and see what everyone else has cooked up for today! For a full list of participants, click HERE. I'm so glad you came by today! Thank you! Have a great day! 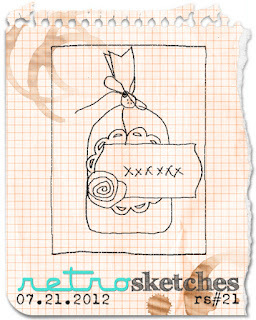 Just wanted to stop in right quick and post the card I made for the Limited Supply Challenge for PTI's Stamp-A-Faire. You can see all about this challenge by clicking HERE. Thanks for stopping in today! 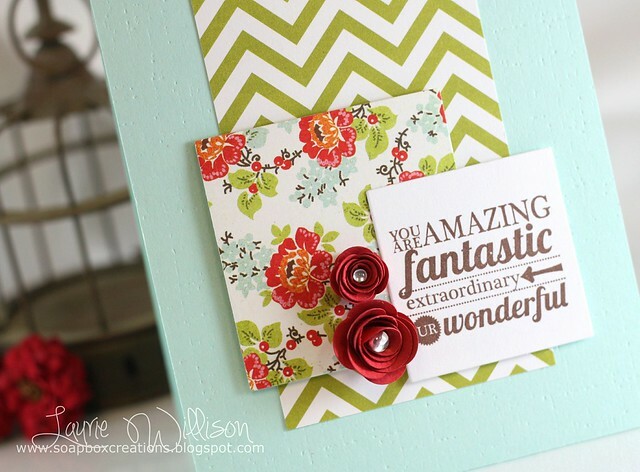 I added some chevron paper in the background with a little of my favorite floral paper right now. (I used it awhile back and had lots questions about what company it was. You can find it HERE.) Sadly, I cut the strip off of the chevron and don't remember what it was. I picked it up in KC and The Scrapbook Page and it was in a 12x12 sheet as well. 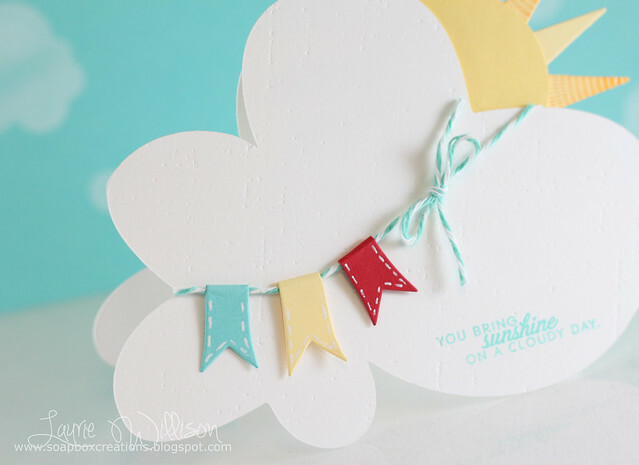 Our super sweet Guest Designer this week is Tracey McNeely. You can see her original card HERE. Also check out what Arielle, Jackie and Kasia have for you too! Then go link up your own creations! Can't wait to see what you create! So for this card, I inked up my Lined IP with Fresh Snow and then ran it through the Big Shot for that distressed textured area. 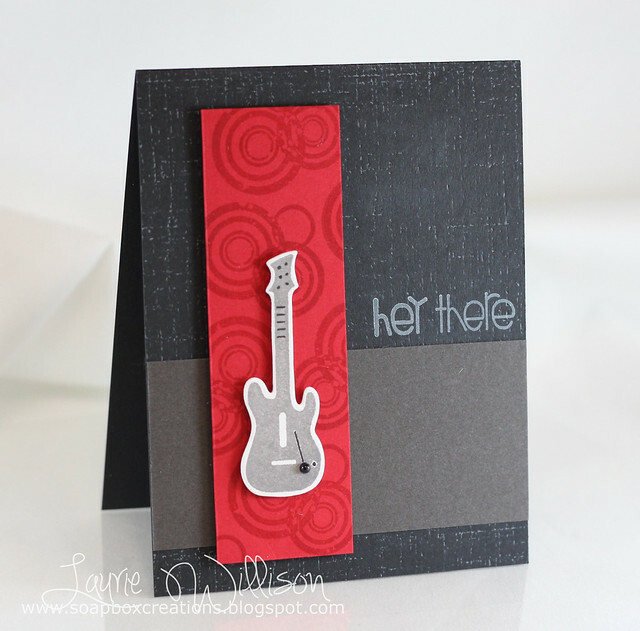 Then I added a couple simple layers and that guitar to top of this fun guy card! Our sponsor this week is Lil Inkers! Go check out the CAS-ual Fridays for more about the prize for the week and see all the other Back in Black creations! Thanks for coming by today! Can I tell you how much I love this stuff? It's amazing! I'm pretty sure it's a must have for any clear stamp stamping just to get that perfect solid image! 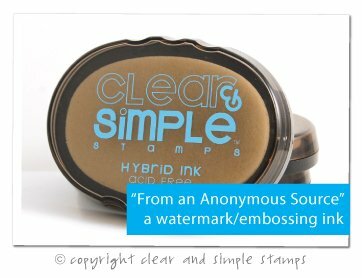 (Can I tell you that I love it way better than Versamark...which I have used since I first started stamping? The watermark image is so much darker and it's just good stuff. Go put it in your cart. hehe! Already in a DVD case, labeled and ready to go. 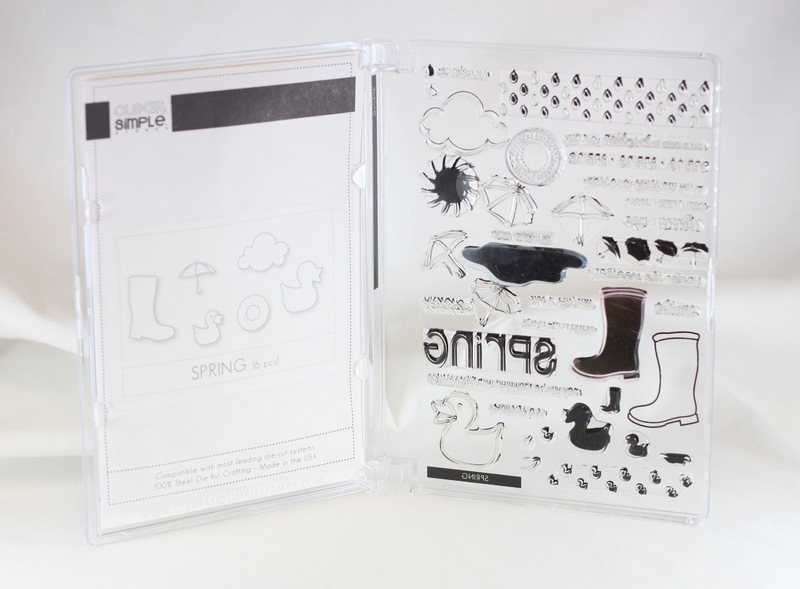 When you open the case, you can see the insert on one side and the stamps on the other. The insert explains the care of your stamps with other important info. 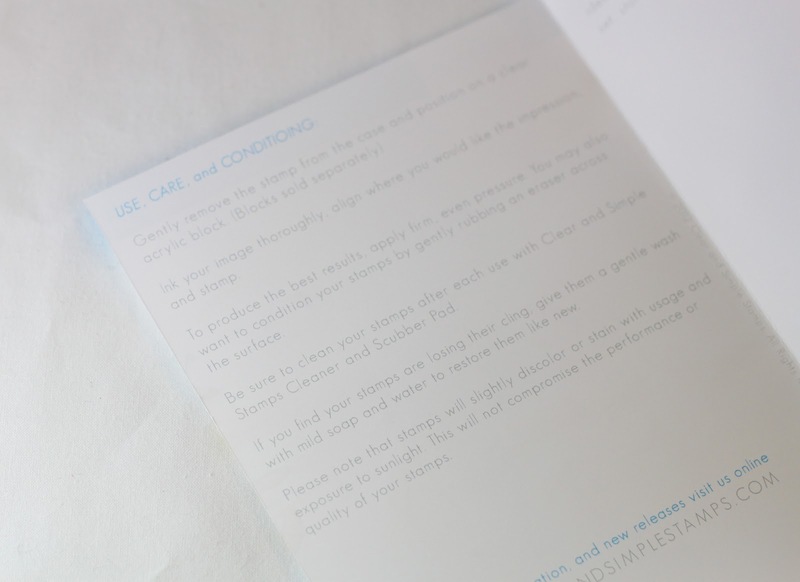 On the other side of the insert is a blank page to jot down ideas, sketches etc. 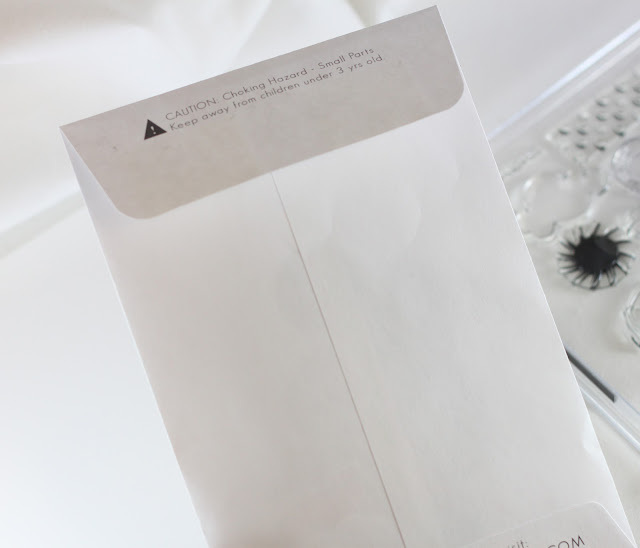 You can also store your masks inside so you don't have to make them again. Super handy!! ....and it fits perfectly inside the DVD case with the insert behind it. I had to add in the picture of the other side too, with the complete index label. I hope that answers the questions I have been getting. If you haven't checked out Clear and Simple stamps yet, you can see their new Collection 4 HERE. Lots of great stuff, amazing stamps and lots of super fun dies! Thanks to everyone for coming by! If you have any other questions, please let me know! Have a great day!